*** Should The U.S. Government Negotiate For Hostages? If you're an American, you don't want to be taken hostage. Since 2001, 90 Westerners have been kidnapped and killed overseas, and according to a January study from New America, 41 of them were Americans. That American deaths are disproportional to the number of total hostages raises the question: Why not negotiate? In the study titled "To Pay Ransom or Not to Pay Ransom? An Examination of Western Hostage Policies," authors Christopher Mellon, Peter Bergen and David Sterman examined the cases of 1,185 Westerners kidnapped overseas by terrorist, militant and pirate groups since Sept. 11, 2001. The study reached two conclusions: "First, countries that do not make concessions experience far worse outcomes for their kidnapped citizens than countries that do. Second, there is no evidence that American and British citizens are more protected than other Westerners by the refusal of their governments to make concessions." The United States should clarify its stance on granting immunity from prosecution to third parties that assist the families and friends of hostages held by terrorists. The United States should facilitate prisoner exchanges for its citizens kidnapped abroad. The United States should encourage more data-driven study of hostage taking. The United States should evaluate the degree to which the rise of digital media has changed the cost-benefit analysis underlying its hostage policy. Afghanistan is well endowed with underground resources, but hundreds of millions of dollars’ worth of minerals are being extracted yearly, unaccompanied by payment of applicable royalties and taxes to the state. The bulk of this industrial-scale mineral looting—which has burgeoned over the past decade—has occurred not through surreptitious smuggling but openly, in significant mining operations, with visible transport of minerals on large trucks along major highways and across the Afghan border at a few government-controlled points. The prior political penetration of power holders and their networks in government, who became increasingly entrenched over time, explains this pattern of looting, which is engaged in with impunity owing to massive corruption of government agencies charged with overseeing the extractives sector, main highways, and borders. The current political and security climate favors continued and even further increased looting, which strengthens and further entrenches warlords, corrupts the government, partly funds the Taliban and reportedly ISIS, and fuels both local conflicts and the wider insurgency. Although the situation is dire and no answers are easy, near-term recommendations that could begin to make a dent in the problem include halting the issuance of new mining contracts, enforcing existing contracts to ensure taxes and royalties are paid, monitoring the transport of minerals on main roads and across borders, and imposing an emergency levy on mineral exports. From Twitter to Telegram, Islamic State (ISIS) sympathizers continue to set up camp on social media platforms around the world. While some of the outlets are far-reaching and transparent, others are insular and protected. The range of platforms, the diffusion of sympathizers, and the sheer volume of content make it difficult for governments and private companies to contain the online ISIS threat. To begin doing so, it is necessary to understand the external factors that have shaped ISIS’s communications strategy. On a strategic level, ISIS is winning the war on social media with effective branding, information distribution, and agenda-setting. For example, in the wake of violent attacks, it has become commonplace for counterterrorism analysts to search for press releases claiming affiliation by Amaq News Agency. In an analysis of the ISIS manual, Media Operative, You Are a Mujahid, Too, the terrorism researcher Charlie Winter argues that the organization’s marketing approach allow ISIS to “forcibly inject itself into the global collective consciousness.” But the group is fundamentally dependent on platforms it cannot control, which leaves it vulnerable to changing regulations and security measures. For example, in August 2015, U.S. authorities arrested Jaelyn Young and Muhammad Dakhlalla, after the couple disclosed their plans to travel to ISIS-controlled territory to undercover agents on multiple social media platforms, including Twitter. In Syria, a targeted strike reportedly killed Junaid Hussein after the British recruiter and hacker left an Internet cafe in Raqqa, ISIS’ de facto capital. ISIS is winning the war on social media with effective branding, information distribution, and agenda-setting. With the announcement of the Strategic Partnership policy, the Indian ministry of defence (MoD) has rolled out a significant initiative aimed at revitalising the ‘Defence Industrial Ecosystem’. This announcement could be ground-breaking. Cementing partnerships with Indian companies is already recognised as an important opportunity for big foreign defence manufacturing companies, providing an impetus to ‘Make in India’. The British defence sector, with its unique expertise and already established long-term commitment, is looking at these developments with attention. The devil will be in the details. But to date, the plans are radical and make the elusive target of 70 per cent indigenous manufacturing, which MoD is committed to, realisable. It’s been over a decade since India’s private sector was directly involved in defence manufacturing. Citing security concerns, India’s defence procurement has largely been driven by various defence public sector undertakings (DPSUs) and the Ordnance Factory Board. While defence manufacturing was ‘liberalised’ in 2001and opened up to not just Indian private players but also to foreign entities (49 per cent FDI), a defence production base outside of the DPSUs and the OFB has not yet been prevalent. Will India Dare To Dream Like China? Like in the case of China, we need an Indian Dream. However, creating and pursuing a national dream will require big, bold decisions. Will we take them? The pulling out of the Paris Climate Accord by the United States (US) has understandably led to international outrage. But what has received less attention is the enormous lament in Western media about the US abdicating “global leadership” to China. This lament isn’t without basis. News about the coming death of India’s information technology (IT) services industry started to trickle in about five years ago. KPMG broke the news of “the death of outsourcing” in a white paper in July 2012. In January 2013, The Economist reported that India was no longer the automatic choice for IT services and back-office work and cited a report by the consulting firm Hackett that the migration of service jobs to India (and other offshore locations) would stop entirely by 2022. Despite such prognostications, there is also optimism about the prospects of India’s IT services industry for the coming decade. First, the industry has gone through, and survived, trying times before, such as the dot-com crash of the early 2000s and the 2008 financial crisis. Second, the major IT services firms devote significant resources to employee training and development, offering world-class facilities and educational programmes for new and existing employees. Third, some of them are also beginning to adopt new business models and develop new products and platforms to wean themselves off low value-added services and time-and-materials and fixed-price pricing models. Finally, the $1.2 trillion global IT industry, growing at a rate of 4% a year, will continue to offer opportunities for IT services firms operating at all stages of the IT global value chain. CIOs (chief information officers), the primary customers for IT services, tend to be risk-averse and like to do business with firms with which they have had good prior experiences. All of these factors should continue to offer opportunities for India’s IT services firms for the foreseeable future. In May, the governor of Indonesia’s capital Jakarta, Basuki Tjahaja Purnama – known more commonly as Ahok – was sentenced to two years’ jail for blaspheming against the Qur’an. Indonesian governors don’t often feature in global news, but Ahok’s case is exceptional, seen as a barometer for the state of Indonesia’s tolerance for religious and ethnic diversity. The world’s largest Muslim state has often prided itself on its pluralism, enshrined in the national motto Bhinneka Tunggal Ika (“unity in diversity”). But now, that unity is being challenged. Ahok’s fate has raised concerns beyond Indonesia’s shores about the use of religious tactics in future elections and the cohesiveness of Indonesia’s pluralism more broadly. In late 2016, Islamic hardliners capitalized on Ahok’s double minority status as a Christian and ethnic Chinese to paint him as “anti-Muslim.” In October, Ahok had said his opponents were misusing the Qur’an to trick people into voting against a non-Muslim. His statements, edited to appear more provocative, went viral on social media. Hardliners fanned condemnation of his statements and mobilized mass protests in the capital (up to 200,000 at their peak in December) to call for his arrest. Not all of Ahok’s policies were popular but these tactics were seen as successful in transforming his double-digit lead into defeat during April’s gubernatorial elections. His prison sentence is also considered a political move, given prosecutors had asked only for probation. The prediction came in a 97-page annual report to Congress that saw advances throughout the Chinese military in 2016, funded by robust defence spending that the Pentagon estimated exceeded $180 billion. That is higher than China's official defence budget figure of $140.4 billion. Chinese leaders, the US report said, appeared committed to defence spending hikes for the “foreseeable future,” even as economic growth slows. The report repeatedly cited China's construction of its first overseas naval base in Djibouti, which is already home to a key US military base and is strategically located at the southern entrance to the Red Sea on the route to the Suez Canal. The U.S. Department of Defense has released its annual report, Military and Security Developments Involving the People's Republic of China, highlighting China's attempts to gain military advantage. China is undergoing a military modernization program that is targeting capabilities with the potential to degrade core U.S. military-technological advantages, states the report. “To support this modernization, China uses a variety of methods to acquire foreign military and dual-use technologies, including cyber theft, targeted foreign direct investment and exploitation of the access of private Chinese nationals to such technologies. The Shia rebels are stalling efforts to negotiate a peace deal. This is seen as an example of Iranian influence because it’s the sort of tactic Iran has often used for a long time. In this case Iranian advisers have convinced Yemeni Shia rebel leaders is that their best chance of coming out of all this intact is to hang on for a bit longer. Waiting for exactly what is a mystery, at least to the public. Some secrets have been revealed. For example Iran has quietly put several hundred Iranian and Lebanese (Hezbollah) advisers and technical experts into Shia controlled northwestern Yemen since early 2015. In that time about fifty of these Iranian personnel have been killed or captured. But the rest have been very effective. But this has not stopped the government forces from advancing although it has slowed them down. In the north government forces are now within 20 kilometers of the rebel held national capital Saana. Living conditions in Saana continue to decline and in April there was an outbreak of cholera (that is spread by infected water and food). This is because the rebels have not put a priority on maintaining the quality of the water supply and now there have been nearly 10,000 cases of cholera with over a hundred deaths so far. Iran blames the people fighting the rebels, especially Saudi Arabia. Last month, U.S. President Donald Trump embarked on his first foreign trip, which began in Riyadh. There, the administration and Saudi officials sent a clear message: Iran is a destabilizing force in the region, which “nations of conscience” must counter. Parts of the trip were heavily criticized in the region and beyond, with some observers even insinuating that the trip sparked a split among the Gulf Arabs. Trump can’t be blamed for that split—the Gulf Arabs are no monolith, and disagreements have been rife—but he did embolden hard-line factions in the Gulf. As the Yemeni conflict dragged on, disagreements within the GCC intensified. How to deal with Iran has always been the subject of debate within the Gulf Cooperation Council (GCC). Although all of the countries in the group aim to stand up to their powerful neighbor, each differs on how. The nuclear negotiations between the P5+1 and Iran brought these divisions to the forefront. Under Saudi Arabia’s leadership, Bahrain and most of the UAE were skeptical of the deal, highlighting their concerns about Iran’s regional meddling. Others, including Oman and the Emirate of Dubai hoped to capitalize on the deal and forge new trade partnerships. Kuwait and Qatar found themselves in the middle. They were eager to contain Iran, but also to lessen tensions. After all, they share interests with Iran, including gas fields and trade. 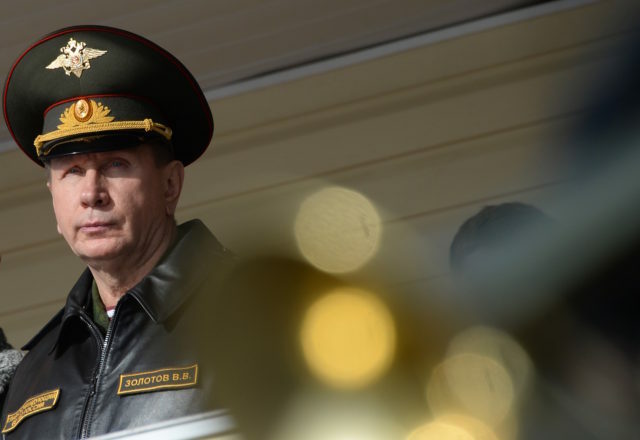 President Vladimir Putin signed a decree late last month (May 24) that lays out drastic changes in the military organization of the Russian state. The bureaucratic document approves “The Statute on the Operational-Territorial Grouping of National Guard Troops of the Russian Federation.” However, it is likely that the decree was signed specifically to enshrine in law one crucial paragraph: “By decision of the President of the Russian Federation, tactical formations and military units of the Armed forces of the Russian Federation, other military formations and organs can be transferred to the operational control of the commander of the district to perform the tasks assigned to the troops of the National Guard” (Pravo.gov.ru, May 25). The Russian National Guard (Rosgvardia) was established in April 2016, largely based on the then-existing Interior Troops, to combat “terrorism and extremism” within the country (see EDM, April 7, 2016). The possibility that the Interior Troops could, in certain situations, be subordinated to the Ministry of Defense existed both in Soviet and post-Soviet times. After all, the “external enemy” could have superiority over the regular Soviet/Russian Armed Forces; to fight against it, the Kremlin needed the ability to focus all of the country’s military or paramilitary units. All major military exercises in recent years had involved units of the Interior Troops subordinated to the Army’s command, and that tradition continued after the Russian National Guard was established. In 2016, joint exercises of the Rosgvardia and the Airborne Troops were conducted in Volgograd region. Four thousand Armed Forces troops, two National Guard brigades, the Special Forces Center and the 56th Separate Airborne Assault Brigade participated. The deputy commander of the airborne forces, Lieutenant General Andrei Kholzakov, oversaw the drills. He explained that the maneuvers took place for the first time “after the reform,” adding, “…we are working on issues of interoperability to understand how we have to operate” (Nezavisimaya Gazeta, August 1, 2016). The reasons why an army general was appointed to command the exercise is clear: his colleagues from the Rosgvardia lacked the experience of planning large-scale operations. Election officials have long contended that the highly decentralized, often ramshackle U.S. voting system is its own best defense against vote-rigging and sabotage . New evidence from a leaked intelligence report indicates that hasn’t deterred foreign adversaries from exploring ways to attack it anyway. The document, attributed to the U.S. National Security Agency, describes alleged attempts by Russian military intelligence to hack into local election systems — the latest evidence of a broad and sophisticated foreign attack on the integrity of U.S. elections. It does not indicate whether actual vote-tampering occurred. The NSA report adds significant new detail to previous U.S. intelligence assessments that alleged Russia-backed hackers had compromised elements of America’s electoral machinery. It also suggests that attackers may also have been laying groundwork for future subversive activity. The string of recent violence began on March 22 with an attack in Westminster, near the British Parliament. A 52-year-old convert to Islam, Khaled Masood, used a white van to strike pedestrians on a bridge. He then ran on foot into Parliament’s New Palace Yard, where he killed a guard before he was shot. On May 22 came the suicide bombing at a concert in Manchester, which was attended mainly by young girls and women. Salman Abedi, the bomber, was a local man who had traveled to Libya with his family some months earlier. He had returned to Manchester just four days prior to the attack. Since 2008, China has been developing a new antisatellite weapon that, once in orbit, can ‘tailgate’ and attack other systems. Unfortunately, and for different reasons, the author of this text doesn’t believe the US will be able to counter this threat. Worse yet, since “space stalkers” can’t be reliably distinguished from ordinary satellites, they can’t be banned. So what’s the solution? The author believes the US should declare and promote a new norm – i.e., any country that configures or readies space stalkers for attack is demonstrating hostile intent and should thus be preempted. The often unclear nature of the capabilities currently available to hostile non-state actors in cyberspace is driving NATO, the U.S. and major global military powers to develop offensive counter-strike capabilities. According to cyber experts, the omnipresent fear among national states is that sophisticated, low production cost cyber weapons could be used to attack critical state infrastructure. This fear is heightened by the danger that the same capability could be made available by terrorist organizations, such as ISIS, to criminal organizations. The general consensus among experts at the Cyber Conflict (CyCon) conference in Tallinn is that not much is known about the offensive capabilities of terrorist groups or what types of new cyber weapons may be under development. NATO and Western powers need to gain a better understanding of how the prospect for lower production costs may relate to the potential development and deployment of offensive weapons capabilities in cyberspace, said Max Smeets, a research affiliate of the cyber studies program at University of Oxford. “It is important that we have a better grasp of costs relating to cyber weapons. This will be essential to understanding what actors – be they state, non-state, or criminal – are likely to attain what types of cyber capability in the future,” said Smeets. The increasing potential for conflict in the cyberspace domain will require governments and militaries to focus more deeply on the specific advantages of using defensive or offensive cyber weapons technologies. Militaries can be expected to develop counter-response “weapons” that have surgical precision strike capabilities. Digitalization, pushed by the rapid advance of digital-based communications, has taken the world from the “Cold War to the Code War” in this battle-space era, said William H. Saito, an IT and cyber threats special adviser to the Cabinet Office of the Government of Japan. “Ten years ago the biggest companies in the world were in oil, now the biggest companies are in technology fields. This new Code War is very different to past threats, in the sense that non-state hostile actors may not have any value in terms of being a real or definable enemy,” said Saito. The core question for governments, militaries and national security agencies, said Saito, is to determine whether it is better to have a good defense or a better offense. “I am not sure that it is a better offense,” Saito told a gathering of cyber experts at the Cyber Conflict (CyCon) 2017 conference in Tallinn. On June 2, 2017, the Health Care Industry Cybersecurity Task Force under the Department of Health and Human Services released its Report on Improving Cybersecurity in the Health Care Industry, beseeching six Congressional chairmen to consider six imperatives along with cascading recommendations and action items that demonstrate the need for a unified public-private collaboration to increase patient safety and to diminish the constant cybersecurity threat to the healthcare sector from cyber criminals, digital mercenaries, techno-jihadists, nation-state sponsored advanced persistent threats (APTs), and others who target vulnerable critical systems and sensitive treasure troves of patient information with ransomware and other malware. The report was incited by the Cybersecurity Act of 2015, but its necessity was reinforced by the recent WannaCry global ransomware attack that crippled over 300,000 systems in 150 countries, including those of at least 16 NHS organizations in Britain. The findings of the task force address the hyper-evolving threat landscape surrounding healthcare systems, electronic patient records, and medical device security by increasing information sharing and awareness, by increasing public-private partnerships, and by establishing a cybersecurity leadership position within HHS. The cyber weapon used in the exercise specifically targeted the radio and wireless communication systems of the tankers. Cyber warfare can include both jamming of communication signals and hacker infiltration into networks, which they can then either disable or manipulate to relay false information to commanders from within their own networks. This capability was also demonstrated in the exercise at Fort Irwin, according to an Army official. Another aspect of cyber warfare explored as part of the exercise was infiltration of civilian networks in order to subdue a population and invade territory.